The children and teachers had a wonderful time celebrating Circus Day at Mary’s Schoolhouse in the Northpark Community of Valencia. What a great way to enable the kids to learn more about the circus and all the happenings typically found when the local circus comes to town. 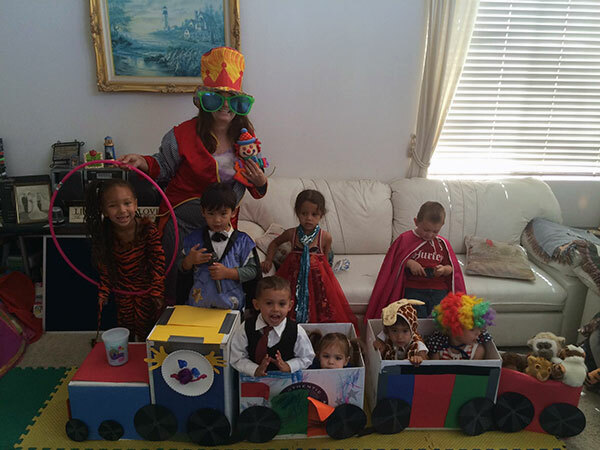 We even had a train full of stuffed circus animals along with kid clowns and children dressed up as circus animals! We made a circus train out of some old boxes, and then we made clown faces using paper plates. We had typical circus foods for lunch, including, popcorn, cotton candy, hot dogs and all rest. The children loved dressing up in our circus costumes we just happened to have on hand in our stock of dress up clothes. 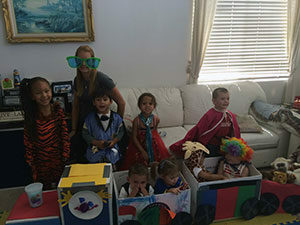 The children dressed as clowns, animals, magicians, and even a master of ceremonies. Since we had a couple part timers miss our Circus Day, we did a few of the activities again the following next day. Just like circus day at Mary’s Schoolhouse in the Northpark community, we enjoy teaching the children by creating various events and having fun at the same time. Yes, the kids have more fun too, and since these are preschool age children, it’s just the perfect way to teach them. Instead of explaining, telling a story or reading a book, we like to have the children learn by having special days enabling the kids to participate in their own education and have fun learning! This method of teaching has much more impact and leaves behind some great memories the children will always remember. If searching for home childcare in North Park of Valencia, be sure to contact us and see if we have any openings. Typically, we care for children of ages between 1 year old up until Kindergarten, we also occasionally have an opening for part time care. You may contact Mary Gregory directly at 661-210-7617. We hope you enjoyed the post and feel free to comment on, Circus Day at Mary’s Schoolhouse in Northpark Community. Pete Gregory on Valencia Home Child Care Has Never Been Better! Cheryl Clifford/Wittmann on Valencia Home Child Care Has Never Been Better! Amani and Annie Move On to Kindergarten | Gregory Family Childcare on Valencia Home Child Care Has Never Been Better!